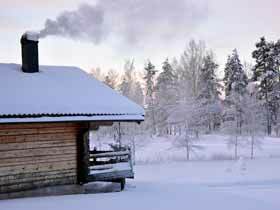 Winter is an ideal time of year for a log cabin holiday in Sweden, whether you are a couple looking for romantic winter evenings by candlelight or an active family wanting a winter adventure with the children. In a typical winter, the snow usually arrives before Christmastime and lasts into late March. Värmland is located in the west of Sweden, bordering Norway, and this area has around 90-150 days of snow cover a year. Simple forest skis are an ideal way to explore the winter landscape. Photo: Caroline Bennett. There are three traditional log cabins spaced about 30m apart, each sleeping up to max. 4 adults (or family of 5 with children) in 2 x 2-person rooms and 1 x sleeping loft (very popular with children! ), meaning this experience is also an excellent choice for 2-3 families or groups of friends travelling together. Each cabin is fully equipped with kitchen, shower, WC and wood-burning stove, and has a veranda looking out over the lake just 75m away. There is also a sauna in an adjacent building for your use. If you plan to have a car during your stay, there are a number of small villages and local restaurants to explore within easy driving distance. The cabins make an ideal base for an active or relaxing winter holiday. Photo: Caroline Bennett. 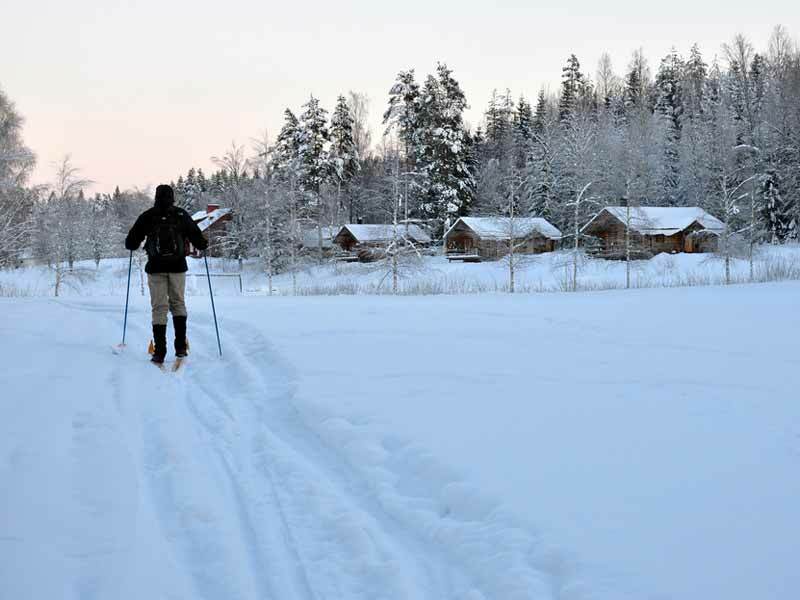 Cross country skiing: There are prepared tracks for cross-country skiing running right from the door and "forest skis" (simple skis that can be used with any winter boots) are available to hire locally. Please note that instruction on using the skis is not available, but the trails are easily followed and the basic technique easily learned. Snowshoeing: A great way to explore the winter world, snowshoes are available to borrow free of charge. Tobogganing: Let your hair down and rediscover the simple joys of tobogganing (children not essential!). Tobaggans are available to borrow free of charge. Ice fishing: The lakes freeze over and it is possible to try your luck at ice fishing (best conditions for ice fishing normally mid-February to late March). Please note that this activity must be guided, min. age 16 years. Guiding and equipment hire can be arranged locally. Downhill skiing: For those who just can't resist the lure of the pistes, there is a small downhill ski area just 30 minutes' drive away (note that you will require a hire car for your stay to access these facilities). Snowmobile tours: Your local host at the cabins is also a snowmobile instructor, with possibilities for half day and full day snowmobile tours in the surrounding area. January-March is normally the best time for snowmobiling. Dog sledding: Dog sledding day tours are available to arrange locally, best time normally January-March. If you feel the urge to explore, go in search of animal tracks in the forest. Among the tracks you may see are moose, deer, fox and pine marten. The area has a large population of beaver, and the tell-tale signs of their industrious efforts are a common sight. You may even find tracks and signs left by some of Sweden's largest and most elusive mammals, the wolf and lynx. 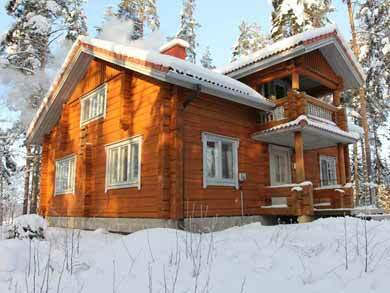 Relaxing and romantic or active and family-friendly, Winter Log Cabin Escape in Värmland is an ideal choice for a log cabin holiday in Sweden. You will have access to your cabin from 15.00. You should aim to arrive between 15.00 and 18.00. Later arrival times are also possible by prior arrangement. Please let us know your estimated arrival time in advance. For guests arriving by public transport, transfer is available from Arvika (approx. 45 mins) as an optional extra. At Arvika you can shop for provisions for your stay before transfer to the cabin. The log cabins are available to rent all year round. Winter activities are normally possible mid-December to late March with best snow conditions January to March. Transfers: For guests travelling by public transport, transfers are required from the train station in Arvika (or Torsby). Please note that transfer times must be booked at least four weeks before departure. NB: Maximum 4 persons can be accommodated in standard transfers. For larger groups, transfer must be arranged by private taxi, cost around 1400 SEK (about £140) return for up to 7 persons. Additional activities: Cross country ski equipment, snowmobile half day and full day tours, ice fishing equipment/guiding and dog sledding day tours are available to hire/book locally with your host. Dog sledding and snowmobiling typically best January-March, ice fishing normally best mid-February to late March. Log cabins situated just 75m from the water with wood-burning stove. Each cabin sleeps up to 4 adults (or a family of 5 with children) in 2 x 2-person rooms (one twin/double room, one room with bunk beds) and 1 x sleeping loft. Please let us know in advance if you have any special requirements (e.g. cot, high chair). Bed linen is provided for guests to make up the rooms as required on arrival. Fully-equipped modern kitchen for self-catering, including microwave. Satellite TV with Swedish, German and one or two English channels. All English-language programmes (films, comedy, etc) shown on Swedish channels are subtitled, not dubbed (with the exception of children's programmes). Sauna is available for your use in a separate building. One basket of firewood is provided for use with wood-burning stove/sauna. Additional wood can be purchased from your host as required. Please note that washing machine facilities are not available at the cabins during wintertime. Toboggans, sleds, and snowshoes are available to borrow from your host free of charge. Additional equipment/activities are available to hire/book locally with your host - see under "Optional Extras". Food: The cabins are fully-equipped for self-catering. The nearest shop is 20km away, 15 mins by car. NB: Please note if you choose not to have a car during your stay that you must have ALL provisions with you before leaving Arvika. There are no facilities where the cabins are located. Time can be allowed in Arvika to shop for provisions before pick-up. See "Optional extras" below for information on transfers if travelling by public transport. General good health - guests of all ages are welcome. 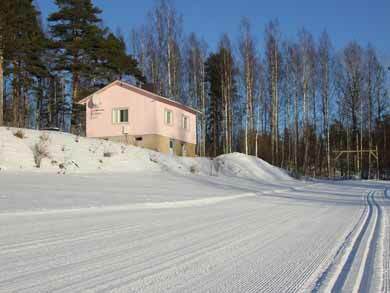 If you wish to do a snowmobile activity during your stay, this activity has min. age 10 years. The log cabins are suitable for up to 4 adults (or a family of 5 with children) per cabin. The cabins are spaced around 30m apart and this experience is ideal for groups or families travelling together who wish to hire two or more cabins. Fly to Stockholm, Gothenburg or Oslo airports for onward travel by train to Arvika or by hire car, travel time 2.5-4.5 hours depending on options chosen. Transfer to/from Arvika train station is available as an optional extra for guests travelling by public transport. Log Cabin Escape in Värmland is the summer version of this experience. 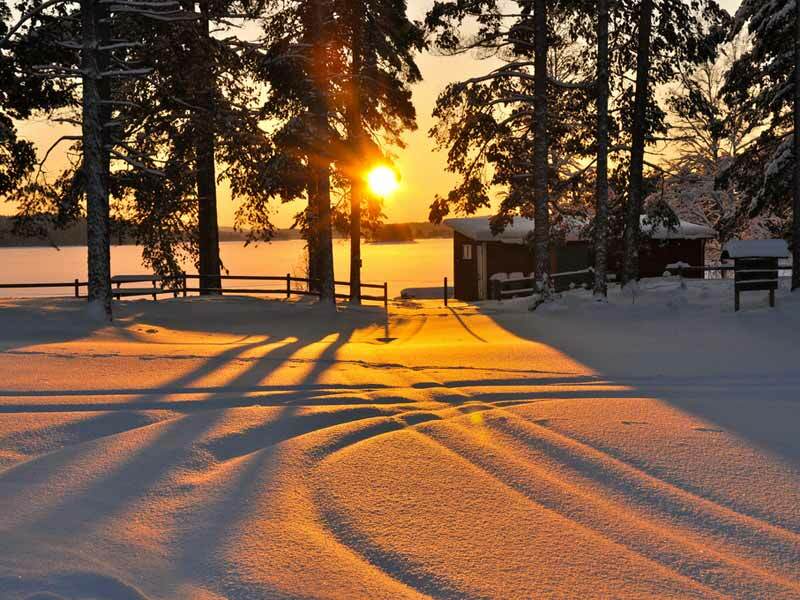 Our Lakeside Cabin Retreat in Värmland cabins are also suitable for stays in winter. They are located just a few minutes from the Log Cabin Escape and offer the same possibilities for winter activities.